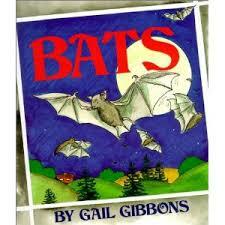 Chris Van Allsburg is a great picture book author that my students love. His books, usually drawn in black and white, which include: Widow’s Broom, The Garden of Abdul Gasazi and The Z was Zapped are always favorites. 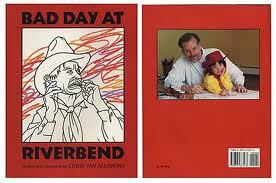 A Bad Day at Riverbend is not immediately identifiable as a Chris Van Allsburg, because it’s full of color. The way it introduces color makes my students, even the most obedient ones, cry out in dismay. The town of Riverbend is in trouble. Riverbend looks like a coloring book. Everything is white, outlined in black. Now, something very strange and scary is happening in Riverbend. Lines of color, like scribbles, are covering things. Stagecoaches rarely come to town, but now a stagecoach has stopped in town… without a driver. It is covered in a slimy, colored substance. No one knows what it could be. The town’s residents are scared. What Luckily, Sheriff Ned Hardy is on the trail. 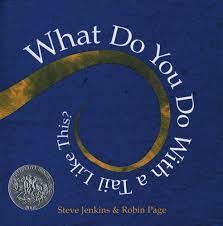 Read this wonderful book to find out what is threatening the town of Riverbend. 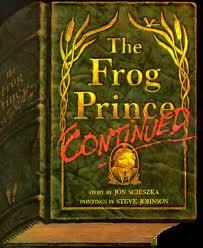 My students loved the ending!